With the country gripped by Olympic and Paralympic fever, it's good to see you getting involved and finding new ways and partnerships to encourage our children and young people to get fit and have fun. We're continuing on our journey to be the best we can be, just like Team GB, and our performance was recently evaluated by Ofsted. It was a good meeting and we'll be seeing them again in November when two inspectors will return for a short monitoring visit. We'll be providing you with more information about this over the next few weeks. I'm continuing my visits around the service and I'm impressed by 'Team Cov'. We've still got lots of challenges ahead of us but it feels like we're pulling together in the right direction. Come along and tell me about your work and where you think we can do better. Thanks as ever for all you do. A new Principal Social Worker is on their way to Coventry. With more than 10 years’ social work experience, Lee Pardy-McLaughlin will join us on 3 October and he’s really looking forward to being part of the team. “Coventry is doing some really good things. New leadership and the progress you’re making on your improvement journey makes it an exciting time to join. “It will be a fresh challenge for me, and I’m keen to celebrate the good work and practice you are doing to improve outcomes for children and young people. The new Chair of the Improvement Board has promised to work with Children’s Services' management team to support staff and make sure that every idea on the journey to improve the city’s Children’s Services will be listened to. Steve Hart took up the role in the spring and he has had a busy few months meeting staff in various roles across the city. Steve said he has been impressed with the way Heads of Service and partners are united in their desire to improve – but that they also know there is hard work ahead. We’re making changes to Protocol to help you to access all the information you need about a child and their family in one easy electronic place. Working with teams in Northwest Neighbourhood and RAS, we’ll be testing out some of the new processes to make sure they work and that they help you to do your job better. The changes will mean fewer paper records and more information stored electronically. This will mean you’ll be able access all the available information about your case in one place. Later this month, you’ll see new options in the Protocol menu. This changes are part of the pilot testing and you’ll be able to continue to use the system as usual. The main difference you’ll notice is the split of documents and forms in the menu. If successful, the changes will be rolled out to everyone using Protocol. Reducing our reliance on paper files will help us to keep information more secure and help you to work from different locations because you’ll be able to access the information you need online. We’ll let you know the results of the pilots and any changes that may affect how you work. If you need any information about the project contact Marc Greenwood x4128. Councillors have agreed to start a formal consultation on the proposals to make £3.8m savings across libraries, children’s centres and youth services. The consultation started on 12 September and runs until 12 December. It follows a period of informal engagement where organisations, residents and community groups were able to talk with the Council about their potential role in the delivery of support and services in communities. 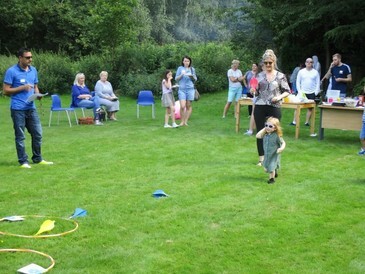 Young people from The Grange and Gravel Hill Children’s Homes, staff, professionals and families gathered for a marathon day packed with Olympic challenges and a barbecued feast. Everyone who attended had to choose a number between 1 and 207 to pick the Olympic nation that they would be playing for on the day. Games ranged from a space hopper race to wellie wanging, and they were rounded off with a giant tug of war. Team Grange was declared the winner and claimed the trophy. The current CAF Co-ordinators' role with schools regarding early help has changing. They will provide enhanced support to school staff enabling them to feel confident to intervene and work alongside families even earlier, leading to better, more sustainable outcomes and children engaging positively in their education. Find out more about what this means..
Do you know what your friend's doing? Young people in Coventry are being encouraged to keep an eye on their mates and look out for signs of grooming and sexual exploitation. The West Midlands-wide digital media campaign was developed with young people. It uses the message ‘Do you know what your friend’s doing’, to highlight key warning signs to help boys and girls from all backgrounds and communities identify concerns and get help. Iqbal Ghag is the new interim Head of Safeguarding. Iqbal was previously Referral and Assessment Service Manager and has already taken up his temporary role. "These are exciting times and I want to be part of the transformation of Children's Services and embed our vision so we deliver meaningful, proportionate, child centred and impact-based interventions for vulnerable children and families," Iqbal said. Karen Ogle is supporting the Referral and Assessment Team. Got that back to school feeling? As children across the city return to school, you too can brush up on your learning. Check out the new training portfolio and brush up your skills today. You can also keep up with the latest practice developments on the Research in Practice website. Local children and young people are getting sporty and healthy, thanks to a new partnership between Route 21 and Sky Blues in the Community.